Brookes, Ronald E. Fiesta, ca. 1961. 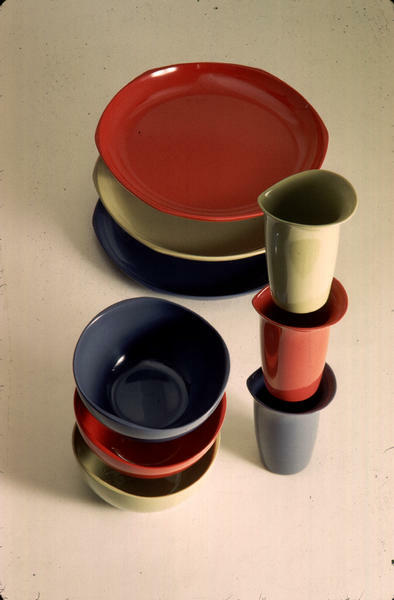 Range of melamine tableware, varied dimensions. Design Council Slide Collection. Farnham, VADS. VADS is an “online resource for visual arts“. Over 12 years, VADS built a portfolio of visual art collections, which comprise of “over 100,000 images that are freely available and copyright cleared for use in learning, teaching and research in the UK“. These collections were contributed by various institutions in the UK. Through the site, users can search or browse by collections and themes. VADS also provides a series of resources that were built around the image collections by “specialist authors and lecturers“. Contents on VADS “may be duplicated by you for your research use or educational purposes in electronic or print form“. Permission is required for other uses. Citation is required with no format is mentioned in their terms. Image can be cited by including creator name, title of image, year of creation (if unknown, indicate n.d.), collection, source and url of image. e.g. Brookes, Ronald E. Fiesta, ca. 1961. Range of melamine tableware, varied dimensions. Design Council Slide Collection. Farnham, VADS. http://www.vads.ac.uk/large.php?uid=61882.